Aquin develops a stringent critique of the Patriote rebellion. He analyses the weakness of the leadership, the lack of battlefield strategy, the sense he has that the Patriotes were looking for defeat — a masochistic response to both the possibility and potential for victory. I have tried to share this sadness. But I cannot share it with the same intensity as people whose experience of history has been forged from generation to generation. I cannot expect myself, nor should others expect me, to internalize the history of Quebec as have the descendents of the original 30,000 French settlers. Mine is an abstract (though profoundly emotional) reading, born of a desire to know and understand. Similarly, there must be reciprocity, for if one national culture is to assert itself, with all of the contradictions which that entails, then it too must recognize other memories and other histories. I am not one of those who believes that the national question can be obliterated. The struggle for identity can go in many different directions. At the root of this struggle, however, are the different strategies which we must all take to understanding, in a very personal sense, the role which we can play at the present time. Whether we are part of Québecois culture or not, we are still the recipients of the contradictions of memory, the idealizations and the errors of history and the ways in which history has been understood and acted upon. One can talk, as many Québecois do, about a collective state of mind, which operates in most modern societies (zeitgeist ). This state of mind cannot be legislated. It can't be created exclusively through political activity. It cannot be constructed through the idealizations of the nationalist perspective. All of these elements, taken together, constitute a fragment of what it means to build up and recognize one's own subjectivity. But the space for subjective growth must not be narrowed to suit the exigencies of the moment. It is precisely this lack of historical perspective which worries me and which characterizes the almost evangelical quality of present-day nationalists. The debate which we have entered into in Quebec seems to be codified along very constricted lines. It is increasingly monological and deferential (e.g., witness the August 1991 Young Liberal Convention in which anybody who was not a nationalist was shouted down). It is a debate in which the future is only being discussed in the most abstract of ways. This is as much a result of an impoverished Canadian understanding of the present and the past, as of an insensitive nationalist movement which does not want to look at the complexity of what it is proposing. It is this notion of openess which has to be introduced into the nationalist discourse. For it is clear that Aquin remained as sensitive to his desires for the independence of Quebec, as he did to his knowledge that it could not be achieved without a heightened appreciation of the complexities of historical knowledge. Among the many lessons which must drawn from his death, one of the most important is that no private act is ever less important than the public context into which it is finally placed. The future of Quebec has to be wrested from the politicians who have taken center stage in defining the rhetoric of change and returned to the people who will have to live with the consequences. This article was written in the 1990's. In September of 2012, the Parti Québecois again came to power and this time with a radical separatist agenda. The ideals of a separate country remain as vaguely articulated as they were in 1980 and 1995. The longing for identity and exclusivity is covered with the same rhetoric of the past as if the world has not changed. The simple equation of language and identity has in fact been reinforced. The Parti Québecois remains caught between a secular world and its roots as a party in the Québec of the 1960's. 13 Yanacopoulo and Sheppard, p. 247. 12 Aquin, The Art of Defeat, in Writing Quebec, p. 71. Aquin wanted a total ‘national revolution’. He wanted to rebuild Quebec society from the bottom up. He wanted to start anew and this led him to analyse both the strengths and weaknesses of his own culture. He saw himself as a representative of the collective will of his people with all of the contradictions which that entails. This is an attractive formulation, a somewhat religious one in fact. It may explain the dark paradox of Aquin's suicide. He offered himself to the Quebec people as myth and this is inevitably the site of a death. No one individual can ever be the nation just as the nation can never be understood or experienced through one person, although we have witnessed many efforts to create and sustain the possibility of that myth (from Lenin and Stalin through to Mao, Thatcher, Reagan, and so forth). In death all of these ambiguities are frozen. In life they undergo neverending change which alters the myth, perhaps fundamentally. Aquin experienced this gap in a very personal way. He grew frustrated with the slowness of change, with the time it takes for any community to alter its norms and values. His death was premature and a profound loss but its ambiguity may be at the heart of the dilemma which many people face in Quebec right now. The simple terms within which national identity is presently being laid out means that any considerations about the future have to be deferred. It will suffice, the modern nationalist argument goes, to regain what has been lost, to live in our own country. My voice is white, male, middle class, immigrant. I have spent most of my life in Quebec. I have married here and my children go to school in this province. However, beyond the stridency and simplicity of labels like anglophone or francophone the question of my identity cannot be reduced to the superficial boundaries of the nationalist debate and this applies as much to Quebec as to Canada. To say that I am either Québecois or Canadian is a caricature of the complexity of my daily life, a rather inept and derivative approach to the quandries of self and other. But I also recognize that the terms of the debate have been set, though the agenda remains uncertain. It is just not enough to respond to the national question in Quebec with an air of complacency, to retreat and then deal with all of the contradictions as if they have come from an elsewhere beyond intellectual reasoning or control. To me the history of Quebec is full of extraordinary ambiguity, ranging from a long tradition of social justice to crass anti-semitism, from democratic practices to extreme forms of authoritarianism, from an exemplary openess to other cultures to narrowness and intolerance. This is not the place to examine all of these shifts, suffice to say that nationalists are rewriting this past in order to imagine a radically different future. Yet there is something troubling about the strategy of post-referendum (1980) nationalists, something which Aquin anticipated in the 1970's. There is a desire to downplay the heterogeneity of identity, to eliminate the contradictions of historical change, to freeze perceptions of Quebec's situation as if it has not evolved or undergone some fundamental shifts over the past thirty years. It is one of the errors of the nationalist movement to presume that all of this complexity can be magically excised through the political process. On the other hand, I would also say that the national imaginary cannot be rejected as irrational. The desire to find some coherence in the maelstrom of activities, thoughts and hopes which any community experiences at an individual and collective level must not be dismissed. To do so would be to deny the role of the community in building an image for itself — to deny the necessity of identity as a cultural, social and political process. Yet even as I say this, I am aware that the terms themselves (the social, for example) have been depleted in meaning by the very activities which should be enriching them. The polarities at work here, most fully symbolised by the terror which has been unleashed in the former Yugoslavia, cannot be resolved within the framework of nationalist ideologies. The nation then, must be seen as a contingent formation and this inevitably creates serious problems for those beholden to its mythic underpinnings. “When we look at ideas about national identity, we need to ask, not whether they are true or false, but what their function is, whose creation they are, and whose interests they serve.”4 White's point is central and it is at the heart of many of the criticisms which have been made of nationalists in Quebec, but it leaves out the crucial need which the community of men and women in this province feel for some kind of place which they can truly call their own. This is perhaps the biggest illusion of them all, but it is also the most powerful. Ownership of place is bound up with an imagined sense of community beyond the more direct relationship of self to the immediate environment in which one lives. People living in the Montreal suburb of Outremont do not call themselves Outremontais. We don't identify ourselves, in the sense of nationhood, with the street which we live on, or the highrise we occupy, or even the suburb we inhabit. It would be absurd to do so and yet these are a few of the most direct instances of attachment to community. Concretely, we co-exist with small groups of people in relatively small social and economic configurations. Yet there is a longing to extend that into something greater, a sovereign realm beyond our immediate control. The only way in which that can be done is through an imagining, through a fantasy of place and then through a conferral of identity from self to an-other. Concretely this means giving over one's identity to politicians who are meant to incarnate what we ourselves lack, or cultural figures who are supposedly more in tune with what we share, than what differentiates us. But this conferral also produces a sense of loss, an almost inescapable feeling that place is not enough. The national imaginary is rarely satisfied with the geographic and psychological boundaries it finally creates, which may explain its link to expansionism and violence. The “eternal” search for Quebec, for a sovereign nation somehow above and beyond the contradictions of class interest or gender or ethnic background, reflects a desire to create a homogeneity which the social, economic and cultural practices of Quebec have long ago left behind. But a crisis of identity, of self and community is characterized precisely by this kind of contradiction. Ambiguity is the motor force, is what impells the nationalist tide to be caught in the past and to long for a utopian future, is what allows projections into the past and future to effectively deny the present. Hubert Aquin asked himself the same question in his very important essay entitled, “The Cultural Fatigue of French Canada,”6 in which he responded to Pierre Elliot Trudeau's (Prime Minister of Canada in the 1970’s and early 1980’s) critiques of Quebec nationalism in the early 1960's. At the same time, Aquin asserts that there is no necessary causal relationship between war and nationalism and that the concept of a national culture cannot be reduced, in a functional sense, to an anticipated future based on a sordid past. If nationalism is unpredictable, it is precisely because it unleashes forces of history which are already in place and which cannot be eradicated by an act of will or by legislation. This is a crucial argument because it suggests that the errors of looking to the political arena for a solution to the national question are being replicated in the federal sphere as well. It makes little sense to argue against the nationalist use of the state as a vehicle for independence, when the federal state is asserting its right to proceed in the same manner, albeit with a different concept of the national heritage. Aquin is also very clear about the heterogeneity of Quebec culture and how immigration has changed the national character. The specificity of Quebec culture long ago dissolved into pastiche, into a hybrid of cultures derived from many parts of the world. It took well into the 1960's before all of the historically embedded institutional practices of the state, the educational system, and the church recognized the characteristics of the shifts which had taken place. Quebec reinvented itself during the post-war period and as it became more cosmopolitan, less xenophobic, more distinctively modern than any part of Canada, nationalists who were partially responsible for the changes grew fearful of the consequences. Continuity and discontinuity can co-exist. It is possible to be a nationalist and still long for the heterogeneity of many cultures. Simultaneously it is possible to deny the results of the mix, to deny difference, to be frightened by the new images of self, negate the reinventions and transform the perception of change into a harbinger of danger. Continuity and discontinuity. Part of what is so attractive about nationalism is the way in which it preserves the past, the way it transforms complex questions of identity into simple answers about community and self. Although, as Benedict Anderson has so cogently argued, adherence to a community larger than one's immediate circle is only possible at a mythic level, this doesn't prevent or inhibit large numbers of people from believing that the interests of the community at large are also their own. Self and identity — these are fluid, ambiguous, often contradictory concepts yet they are bandied about by present-day nationalists as a currency of exchange, a political lexicon utilized to gain votes. But identity can no longer be talked about in the singular, for what is driving this nation-state-province forward at the moment are the many conflicting identities which are at its very heart. The desire to purify these conflicts, to rid the present of the differences which constitute it, to protect a culture which no longer carries the same messages it did even fifteen years ago, is rooted in a nostalgia for a past seen as simpler and more manageable. The difficulty is that there is no turning back. As the environment deteriorates, as urban life becomes less and less amenable, as the complexity of modern life accelerates and solutions seem ever more distant, nationalist ideology seems to suggest the possibility, if not the probability, of control. No better evidence of this than the recent speech by Lorraine Pagé, head of the Quebec Teacher`s Federation, in which she extolled the virtues of a Quebec somehow free of all the restrictions which now prevent it from realising itself — a kind of pastoral myth of togetherness and harmony in a new Quebec produced by the magic of independence. Many of the submissions to a recent Quebec government commission on the constitution echoed this concern, this need to create a new territory (both geographical and psychological) in which the sacred characteristics of the Québecois identity could be enshrined in a political form and in which a measure of authority could be regained over social and economic processes which have become increasingly fragile. The paradox is that there is a vast gap between the way individuals create their own identity and the way political institutions respond. The structural differences between community, family, the individual and the state are vast and usually fraught with contradiction and conflict. What makes the nationalist movement think that these contradictions can be overcome? This, it seems to me is a crucial question which cannot be evaded, because it deals with power and the relationship between the state and the individual. Would a uniquely Québecois territory be different from the present? Are there political models being discussed which point the way to new social and economic configurations which would fundamentally transform existing power relations? These questions mesh with another. What are the conditions upon which, through which the new self can be constructed? In other words is the state, in its present form, a vehicle for genuine transformation? The tendency is to see this process as inevitable. Change will occur because the identification of the individual with the state will be so strong in an independent Quebec, it will overcome hitherto serious problems of an economic, cultural and linguistic nature. This leads to an even more complex irony. The state, now sovereign, will cease to be instrumental and manipulative and instead will work for the betterment of the social whole. Presumably these conditions are not in place at the moment, but this is a projection which can only be tested by the experience of independence. Nationalists turn to language as the unifying force upon which a new and more culturally homogeneous nation can be built. This assertion has been a consistent feature of the nationalist argument. I am by no means suggesting that language is not the focal point for a community's perceptions of itself and of others. But it is not the simple bulwark which nationalists have made it out to be. In fact language is a contradictory site of identity because there is no simple, transparent link between the rhetoric of the day and its interpretation by the community at large. More often than not language acts as a support for the community but at an abstract level. The lived relations which make up everyday life have a specificity of which language is a part, but not the whole. For example, the power relations in a factory will not change radically if the workers are encouraged to speak in their mother tongue. As the new global economy suggests, it is not language at a simple level which empowers. The problem is far deeper than that and is centred on the political economy of capitalism and the market economy. Gender relations are not solely dependent on language. Language does not exist in a sovereign realm and this is confirmed by the endless debates in the courts about the interpretation of laws or the circular arguments around the meaning of national identity. The power of language resides with its practicioners. Language is an expression of identity and laws can be enacted to protect a language, but the law cannot reach into all the spheres which a community uses to define itself. At the centre of this malaise and ambivalence, lies a concern for linguistic sovereignty — language as the people — the identity of the people through their language. But any language is alive with paradoxes, not the least of which is that it cannot protect a culture against change, nor against a variety of evolutionary forces. The Québecois have always assumed that they live on a continent awash in English, but in fact there are hundreds of languages spoken in North America, and this is reflected not only at the level of dialect, but in the history of rural and urban settlement. English is dominant, but to what degree would independence change the defensive structures already in place in Quebec? Crucially, language may be that which unites a diverse grouping of people into a sense of completeness, but it is also that which imprisons its practicioners. For language is never simply the site of a possession — language is not like private property. Language is not a ‘natural’ characteristic of a community, it is the product of social practices which survive, of necessity, through consensus and conflict. There is no perfect moment of language as both the motor force and protector of a culture. And what must be understood here is that most languages develop through their relationship to other languages. This lack of isolation is creative and without it many languages would long ago have died out. The tension here is between that which is perceived to be foreign and that which is not, and the struggle to keep these elements separate and yet somehow contingently related, is at the heart of the fatigue which Aquin talks about. There is a lack of stability to the relationship between identity and language and this produces a profound sense of dispossession . It is as if there is a built-in limitation to what appears to be an almost natural linkage. Since identity is never stable and needs to be worked on in a continuous way, it becomes clear that the question of identity will never be solved. This may explain the repetitive and cyclical nature of the independence movement. But it does not explain it away. Nor should it. I am aware that I am treading very carefully through a minefield of complex issues here. I want to avoid the strategically chosen ahistoricism of many Canadian federalists. The pain which Aquin expressed has its roots in a set of memories which I do not share but with which I must co-exist. In this context it is just not enough to simply acknowledge that the British conquered Quebec in 1759. It is not enough to dismiss a crucial moment in the history of Quebec as if that dismissal will, in a simple sense, rid us of the memory. The memory of Culloden is etched into Scottish identity, inscribed in their sense of history and self. Why is it so inconceivable to the non-Québecois or to the anglophone living here for the conquest to be remembered in the same way? Durham clearly states that he wants to obliterate the minority . 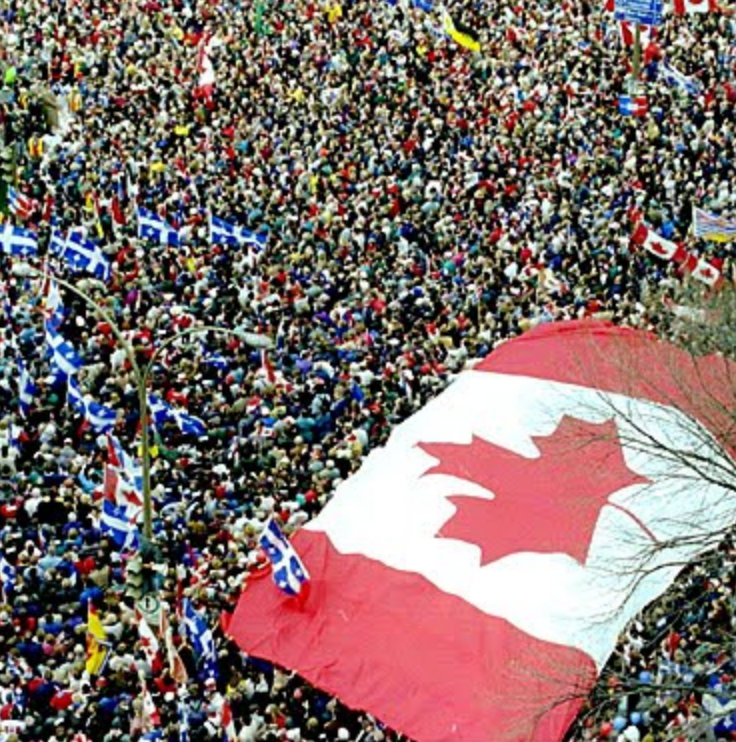 Why should these events be erased from the memories of the Québecois? This is a question which cannot be answered by those who do not share a similar sense of the past. The point here is that no one has the right to expect that the Québecois will simply eradicate that past to suit the present, in the same way that we would not want to eliminate the fact that in 1867 Canada was formed as a country. Certain historical moments take on a foundational character and it is rather superficial to suggest that some should be eliminated while others are retained. 3 Eduardo Galeano, “Celebration of Contradictions” in The Book of Embraces , (New York: Norton, 1991), p.125. 5 Benedict Anderson, Imagined Communities: Reflections on the Origin and Spread of Nationalism, (London: Verso, 1983), p. 16. 6 Hubert Aquin, Writing Quebec: Selected Essays by Hubert Aquin, ed. by Anthony Purdy, (Edmonton: University of Alberta Press, 1988), pp. 19-48. 11 Lord Durham's Report, quoted in The Imaginary Canadian, by Tony Wilden, (Vancouver: Pulp Press, 1980), p. 71. This little known book deserves a larger audience. It was written by one of Canada's most brillant social theorists, whose texts in Communications theory and Psychoanalysis have become classics and been recognized in most countries except Canada.